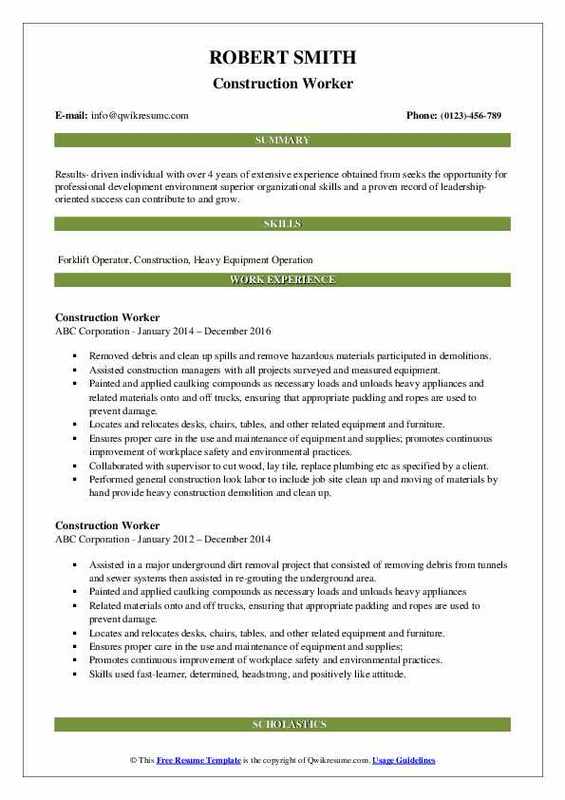 The job summary of a Construction Worker is vast and includes many things such as – assisting the tradesman on sites, loading and unloading materials, mixing and pouring materials and assisting in blasting and drilling. 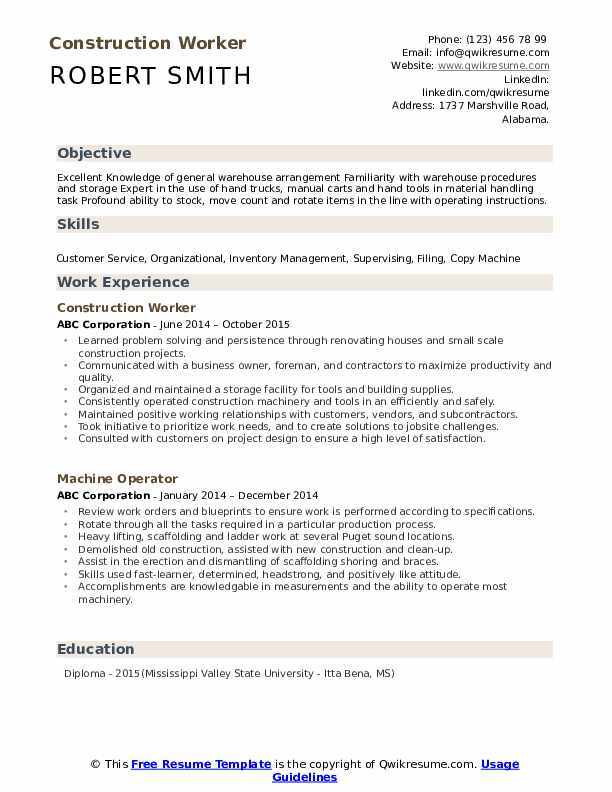 Other core duties are listed on the Construction Worker Resume as – assisting site workers in erecting buildings and structures, distributing materials, removing debris, erecting traffic control signs, assisting in demolishing buildings using explosives, smoothing and leveling new concrete, assembling and applying construction materials; and adhering to safety laws and regulations. 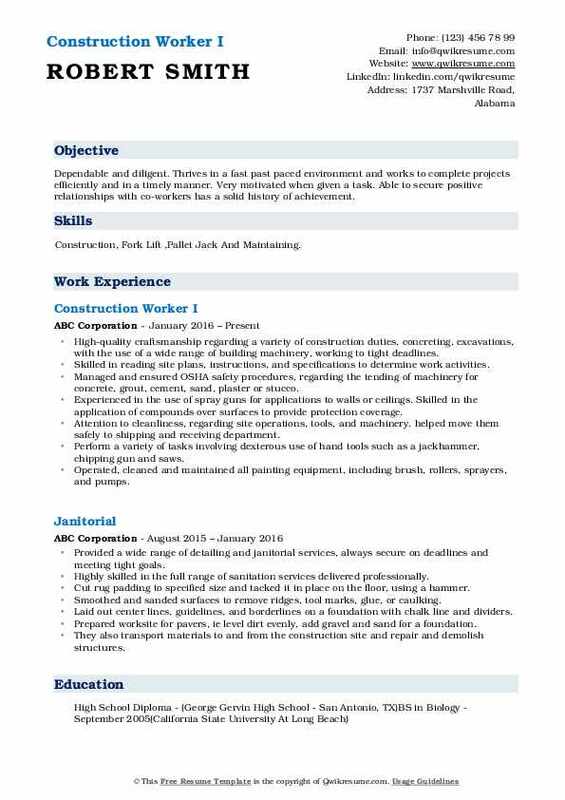 The job description should contain the following specifications – hands-on experience with construction tools and equipment such as drills and hammers; knowledge of construction operations, familiarity with blueprints, experience in mixing and pouring construction materials, and excellent physical stamina. A high school diploma or GED is commonly seen on job resumes. 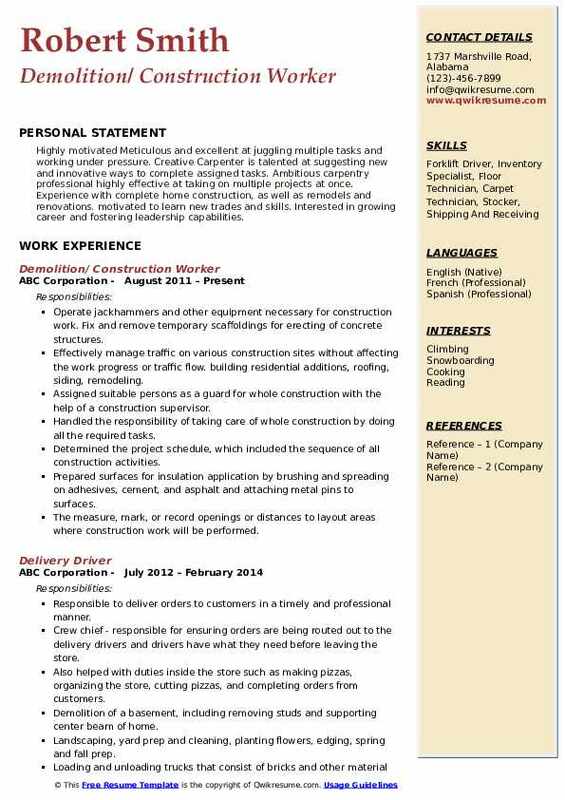 Objective : Excellent Knowledge of general warehouse arrangement Familiarity with warehouse procedures and storage Expert in the use of hand trucks, manual carts and hand tools in material handling task Profound ability to stock, move count and rotate items in the line with operating instructions. Learned problem solving and persistence through renovating houses and small scale construction projects. Communicated with a business owner, foreman, and contractors to maximize productivity and quality. Organized and maintained a storage facility for tools and building supplies. Consistently operated construction machinery and tools in an efficiently and safely. Maintained positive working relationships with customers, vendors, and subcontractors. Took initiative to prioritize work needs, and to create solutions to jobsite challenges. Consulted with customers on project design to ensure a high level of satisfaction. Constructed and maintained hog production facilities, including installation and repair of feed, water, heating, and ventilation systems. Headline : Meticulous material handler skilled at juggling multiple tasks and working under pressure. Skilled Team Leader well-versed in warehouse operations, shipping and logistics. Exceptional organizational skills and strong attention to detail. Reliable and hardworking warehouse operator committed to getting each job done as quickly, efficiently and safely as possible. 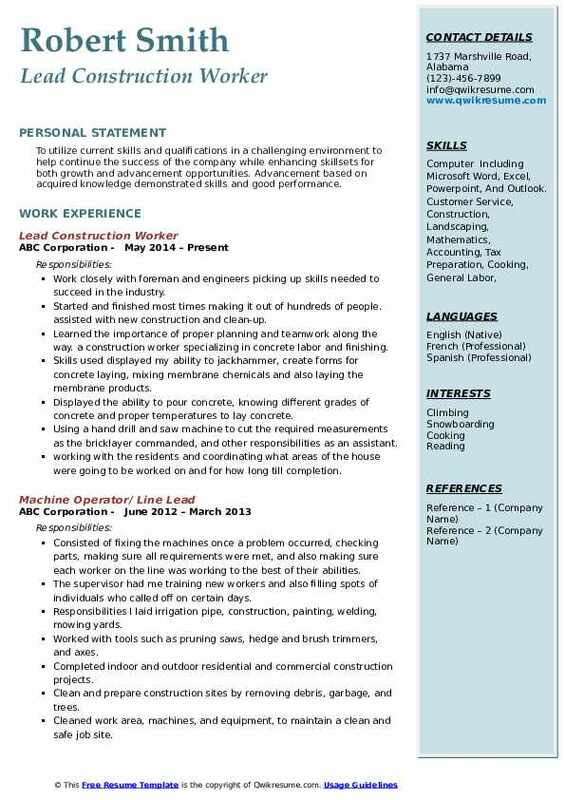 Skills : Welding, Automotive Technician, Agricultural Farming, Construction, Boilers, Retail Sales, Painter, Hard Worker, Stocking, Forklift Operator, Warehouse. Perform picking duties in an efficient manner that meets service standards. Maintain the facility's equipment and materials in a neat, clean, and orderly fashion. Perform or assist in building, grounds, and equipment maintenance as required. Objective : Results- driven individual with over 4 years of extensive experience obtained from seeks the opportunity for professional development environment superior organizational skills and a proven record of leadership-oriented success can contribute to and grow. Removed debris and clean up spills and remove hazardous materials participated in demolitions. Assisted construction managers with all projects surveyed and measured equipment. Painted and applied caulking compounds as necessary loads and unloads heavy appliances and related materials onto and off trucks, ensuring that appropriate padding and ropes are used to prevent damage. Locates and relocates desks, chairs, tables, and other related equipment and furniture. Ensures proper care in the use and maintenance of equipment and supplies; promotes continuous improvement of workplace safety and environmental practices. Collaborated with supervisor to cut wood, lay tile, replace plumbing etc as specified by a client. Performed general construction look labor to include job site clean up and moving of materials by hand provide heavy construction demolition and clean up. 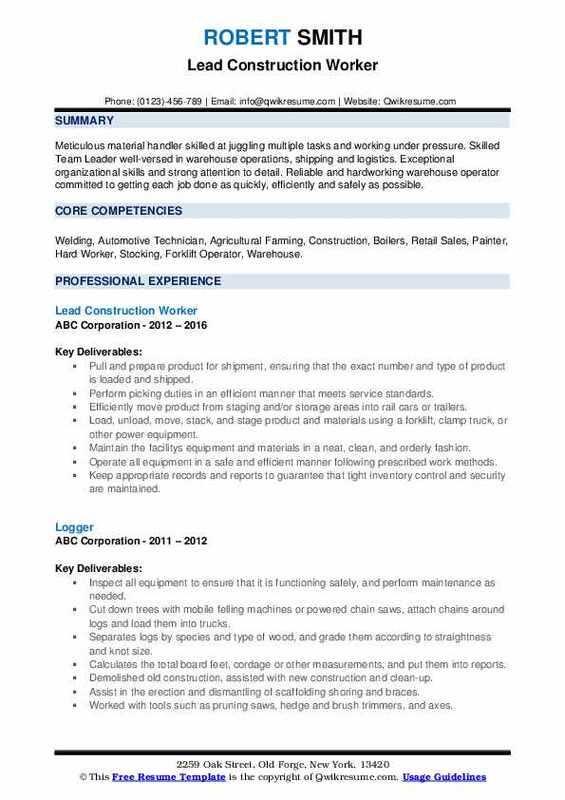 Objective : Experience as a salesman, a warehouse worker, and a mechanical engineer. 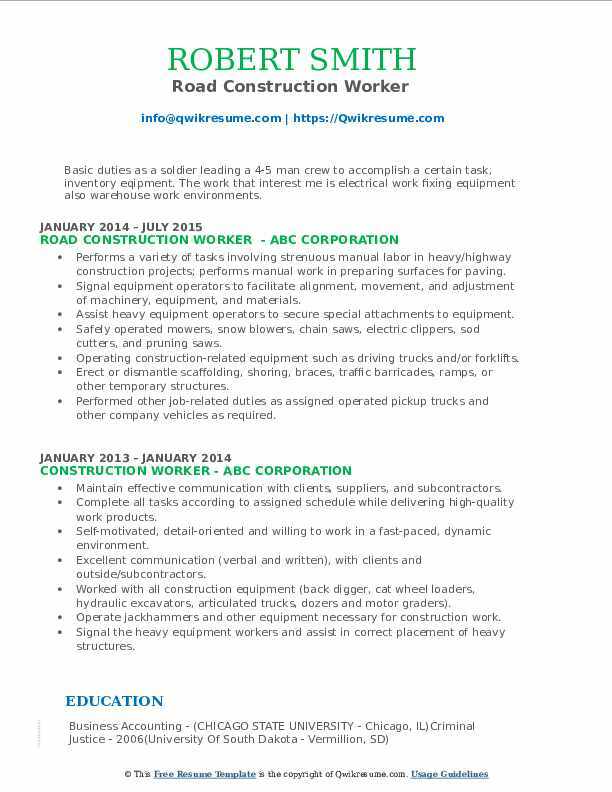 Interested in working with a growing company in an interesting position with an area to grow and succeed within the company. Hardworking and consistently sets firm goals for myself and wants to work for a successful company with strong leadership and vision. Monitored tool and equipment condition and arranged for repairs when needed. Read and interpreted blueprints and construction documents to determine project directives. Installed interior finish items, including wall protection, doors and hardware, toilet accessories, cubicle curtain tracks, and tv brackets. Constructed safety provisions, including scaffolding, gang ladders, perimeter railings, fall protection, and temporary covers. Organized and supervised cleaning crew while maintaining the safety of our surroundings in accordance with OSHA laws. Maintained safe working ethics so as to ensure that projects were completed properly and without injury. Measure water and cement to mix cement in the mixer, measure and cut wire, lath, do patches of scratch brown and finish with color. Headline : To utilize current skills and qualifications in a challenging environment to help continue the success of the company while enhancing skillsets for both growth and advancement opportunities. Advancement based on acquired knowledge demonstrated skills and good performance. Work closely with foreman and engineers picking up skills needed to succeed in the industry. Started and finished most times making it out of hundreds of people. assisted with new construction and clean-up. Learned the importance of proper planning and teamwork along the way. 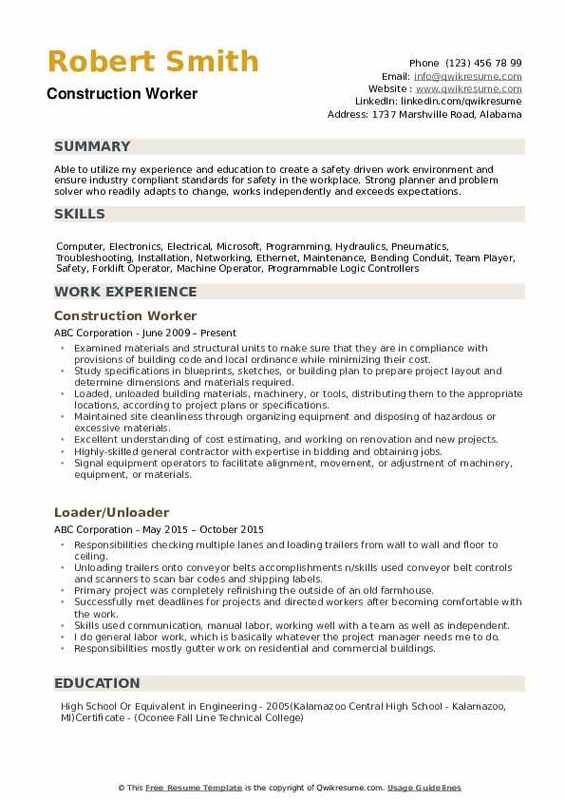 a construction worker specializing in concrete labor and finishing. Skills used displayed my ability to jackhammer, create forms for concrete laying, mixing membrane chemicals and also laying the membrane products. Displayed the ability to pour concrete, knowing different grades of concrete and proper temperatures to lay concrete. Using a hand drill and saw machine to cut the required measurements as the bricklayer commanded, and other responsibilities as an assistant. working with the residents and coordinating what areas of the house were going to be worked on and for how long till completion. Objective : Dependable and diligent. 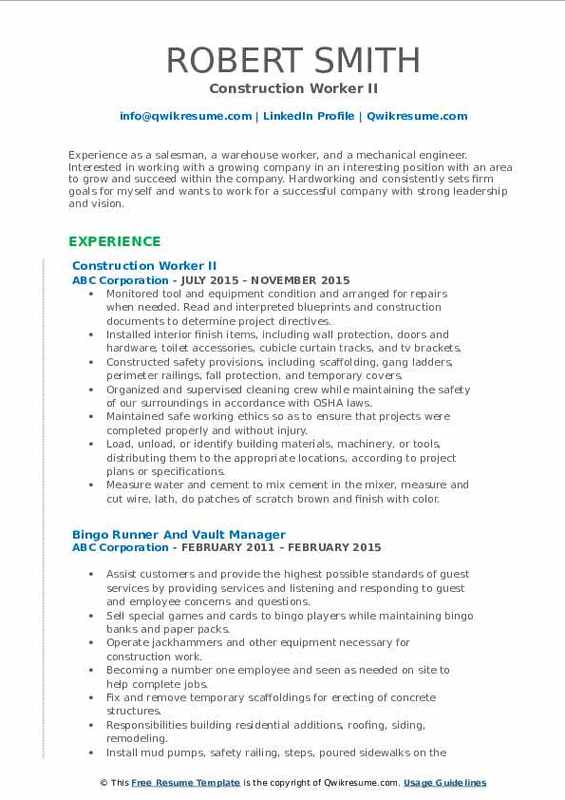 Thrives in a fast past paced environment and works to complete projects efficiently and in a timely manner. Very motivated when given a task. Able to secure positive relationships with co-workers has a solid history of achievement. Skills : Construction, Fork Lift ,Pallet Jack And Maintaining. High-quality craftsmanship regarding a variety of construction duties, concreting, excavations, with the use of a wide range of building machinery, working to tight deadlines. Skilled in reading site plans, instructions, and specifications to determine work activities. Managed and ensured OSHA safety procedures, regarding the tending of machinery for concrete, grout, cement, sand, plaster or stucco. Experienced in the use of spray guns for applications to walls or ceilings. Skilled in the application of compounds over surfaces to provide protection coverage. Attention to cleanliness, regarding site operations, tools, and machinery. helped move them safely to shipping and receiving department. Perform a variety of tasks involving dexterous use of hand tools such as a jackhammer, chipping gun and saws. Operated, cleaned and maintained all painting equipment, including brush, rollers, sprayers, and pumps. Objective : Basic duties as a soldier leading a 4-5 man crew to accomplish a certain task, inventory eqipment. The work that interest me is electrical work fixing equipment also warehouse work environments. Performs a variety of tasks involving strenuous manual labor in heavy/highway construction projects; performs manual work in preparing surfaces for paving. Assist heavy equipment operators to secure special attachments to equipment. Safely operated mowers, snow blowers, chain saws, electric clippers, sod cutters, and pruning saws. Operating construction-related equipment such as driving trucks and/or forklifts. Performed other job-related duties as assigned operated pickup trucks and other company vehicles as required. 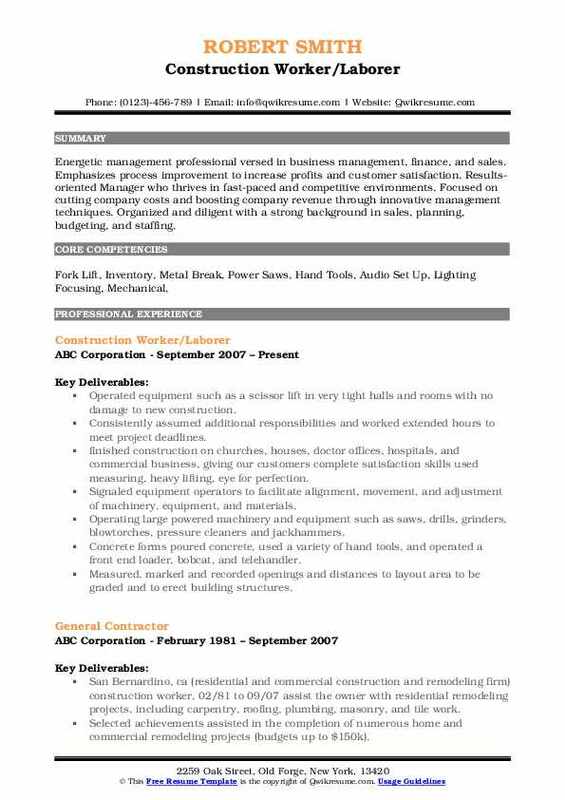 Summary : Energetic management professional versed in business management, finance, and sales. Emphasizes process improvement to increase profits and customer satisfaction. Results-oriented Manager who thrives in fast-paced and competitive environments. Focused on cutting company costs and boosting company revenue through innovative management techniques. Organized and diligent with a strong background in sales, planning, budgeting, and staffing. Operated equipment such as a scissor lift in very tight halls and rooms with no damage to new construction. finished construction on churches, houses, doctor offices, hospitals, and commercial business, giving our customers complete satisfaction skills used measuring, heavy lifting, eye for perfection. Signaled equipment operators to facilitate alignment, movement, and adjustment of machinery, equipment, and materials. Operating large powered machinery and equipment such as saws, drills, grinders, blowtorches, pressure cleaners and jackhammers. Concrete forms poured concrete, used a variety of hand tools, and operated a front end loader, bobcat, and telehandler. Measured, marked and recorded openings and distances to layout area to be graded and to erect building structures. Applied caulking compounds by hand and with caulking gun to seal crevices. Headline : Highly motivated Meticulous and excellent at juggling multiple tasks and working under pressure. Creative Carpenter is talented at suggesting new and innovative ways to complete assigned tasks. Ambitious carpentry professional highly effective at taking on multiple projects at once. Experience with complete home construction, as well as remodels and renovations. motivated to learn new trades and skills. Interested in growing career and fostering leadership capabilities. Operate jackhammers and other equipment necessary for construction work. Fix and remove temporary scaffoldings for erecting of concrete structures. Effectively manage traffic on various construction sites without affecting the work progress or traffic flow. building residential additions, roofing, siding, remodeling. Assigned suitable persons as a guard for whole construction with the help of a construction supervisor. Handled the responsibility of taking care of whole construction by doing all the required tasks. Determined the project schedule, which included the sequence of all construction activities. Prepared surfaces for insulation application by brushing and spreading on adhesives, cement, and asphalt and attaching metal pins to surfaces. The measure, mark, or record openings or distances to layout areas where construction work will be performed. Summary : Able to utilize my experience and education to create a safety driven work environment and ensure industry compliant standards for safety in the workplace. Strong planner and problem solver who readily adapts to change, works independently and exceeds expectations. Examined materials and structural units to make sure that they are in compliance with provisions of building code and local ordinance while minimizing their cost. Study specifications in blueprints, sketches, or building plan to prepare project layout and determine dimensions and materials required. Loaded, unloaded building materials, machinery, or tools, distributing them to the appropriate locations, according to project plans or specifications. Maintained site cleanliness through organizing equipment and disposing of hazardous or excessive materials. Excellent understanding of cost estimating, and working on renovation and new projects. Highly-skilled general contractor with expertise in bidding and obtaining jobs. Coordinated in a team of workers to plan and execute building goals for the summer.